Doctors believe they may have found an effective treatment for people stung by deadly irukandji jellyfish. This species of jellyfish has been found off the coast of north-eastern Australia. Last year, it was blamed for the deaths of two swimmers. Another 120 needed hospital treatment after being stung. But doctors in Queensland say magnesium infusion can fight the jellyfish's lethal venom. The treatment has been tested on pigs. Doctors have now reported success in humans, with two patients recovering fully after being stung. Dr Michael Corkeron, director of intensive care at the state's Townsville Hospital, said: "The remarkable thing is that magnesium infusion is a long-established, very safe and inexpensive treatment." Experts welcomed the breakthrough but said further research is needed. Peter Fenner, a jellyfish expert, said: "Of course, two patients doesn't make a whole solution but it's an extremely helpful tool for hospital treatment. "Our knowledge of this syndrome has really expanded in the last few years and we are cautiously optimistic with these treatment results." He added that scientists would need to develop an oral treatment for victims who are stung a long way from hospital. There was concern that last year's attacks would threaten tourism in the area, which boasts the Great Barrier Reef among its attractions. Queensland Health Minister Wendy Edmond welcomed the breakthrough. She said the treatment "has the potential to significantly improve the recovery of the scores of people affected by irukandji syndrome across the north each year." One of those to die in last year's attack was British tourist Richard Jordan. 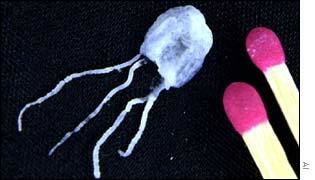 Mr Jordan, 58, from Driffield in east Yorkshire, suffered a brain haemorrhage after he came into contact with the almost invisible, peanut-sized jellyfish. Little is known about this species of jellyfish except that its sting can cause severe pain, anxiety and a potentially fatal rise in blood pressure.